We are proud of our past but our eyes are set on the future! Our history goes back to 1997 when Collegium Civitas was established with the initiative of a group of well-known scientists of the Polish Academy of Science, the most prestigious Polish educational and institution. 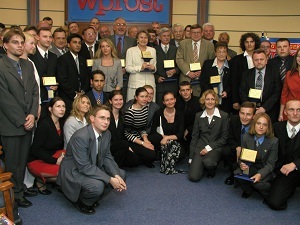 Professors from 5 institutes of PAN –Political Studies, Philosophy and Sociology, of History, History of Art, and Slavic Studies contributed their experience and knowledge to create Collegium Civitas – a modern institution which would offer the world-class standards of higher education to Polish and international students. We are the only university in Poland that can pride itself on such close relations with so many reputable institutes. Educational tradition meets modern approaches to students! 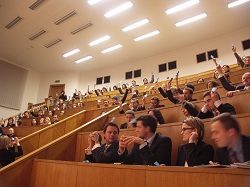 Collegium Civitas is the first non-public university in Poland open to new and rewarding inventions in higher education: interdisciplinary approaches, closer lecturer-student relations, study abroad programs, internships, and the encouragement and supervision of individual student research projects. Due to mutual efforts of our founders, lecturers and students Collegium Civitas has grown into a true 21st century university. Collegium Civitas was a first non-public university to welcome on board foreign students in 1997. Since then our exquisite program of studies in English has attracted hundreds of international students from all over the globe. In Collegium Civitas international cooperation is a key! During last 20 years Collegium Civitas has hosted a number of high-ranking scholars, both Polish and international, teaching a diverse range of courses.